Valentine’s Photo with Heart! Do you want to use technology to create a Valentine’s Day card but you don’t have skill or access to Adobe PhotoShop? No problem! 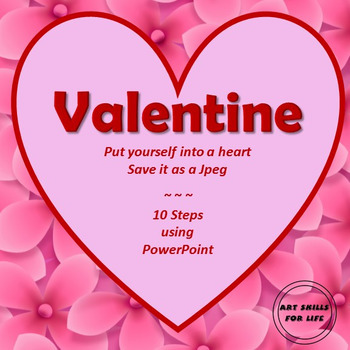 You can easily create a heart around an image using Microsoft PowerPoint, in ten simple steps. This is a two-page instructional handout of technique, one page of assignment expectations with self-assessment rubric, teacher's marking sheet, and sample of finished product. Happy Valentine’s Day! Thank you for checking them out. Don't forget to earn your TPT credits, simply by rating the products you purchase. On your My Purchases page you will see a Provide Feedback button. Feedback helps me determine how and if I can improve my products. Be sure you are a follower of my store to receive notifications of new products, sales, and any updates of products that have been improved since your original purchase. Thank you for your interest! Work smarter, not harder!